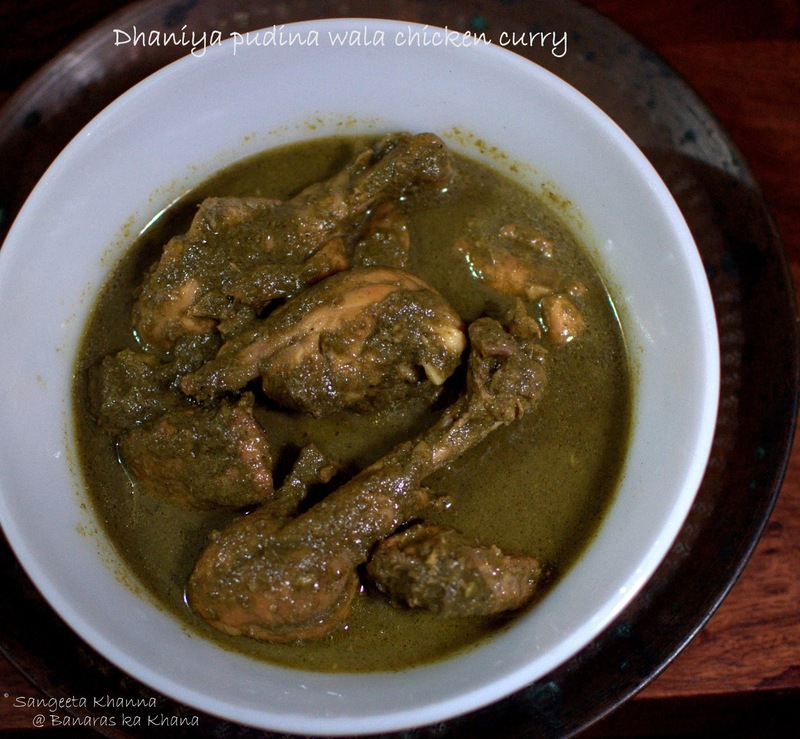 Hara dhaniya pudina wala murgh or chutney wala chicken, these are the names we have given to this green curry I make. Many of my friends have been complaining I don't post everyday chicken recipes much and today even a young daughter of my old friend asked me the same question. She lives and works in Senegal and wanted to have a few quick chicken curries for herself. I found this poor quality picture in my albums but who cares when the recipe works. Here is a quick recipe of a chicken that has been repeated the most in my kitchen whenever I want a quick and light chicken curry either for the two of us or to serve to a gathering is there are other heavier side dishes. This curry has been loved immensely by everyone who tasted but unfortunately I never got to click a picture ever. The reason is, I mostly make this curry in a hurry or when I am exhausted but want a tasty filling meal for ourselves. This time too I clicked a quick pictures just before serving it without any garnish. Actually this curry wont require any garnish ever. Since the curry is simple, just a paste to be made, chicken to be marinated for 2-3 hours or overnight and then everything simmered on low heat for about an hour. Yes, an hour is a good time and I say that I cook this curry in a hurry. See I work from home and simmering the curry for an hour on very low heat suits me well. No stirring, bhunoeing or frying involved and the green paste can be made ahead. Make a fine paste of everything except the chicken. Add about 1/2 cup of water to make the paste in your food processor. Marinate the chicken in this green paste and refrigerate for at least 2 hours. If you plan to keep it overnight, do not add the lime juice as it makes the chicken quite tart. Lime juice can be added at the time of cooking. At the time of cooking, transfer the ingredients into a thick base pan and simmer or low flame for about an hour. Check after 40 minutes and take off fire if it is done. You can add some more water to the cooking mixture if you feel it can stick to the bottom. Adjust seasoning and consistency of the gravy and serve hot with other vegetable side dishes and chapatis or rice or pulao. You can add 2-3 tbsp of thick cashew paste to this curry to make it creamy and a bit indulgent. That version is more rich looking and is liked by all similarly. The same curry can be made using chicken mince if you really are in a hurry. It cooks in just 15-20 minutes and doesn't need marination time. 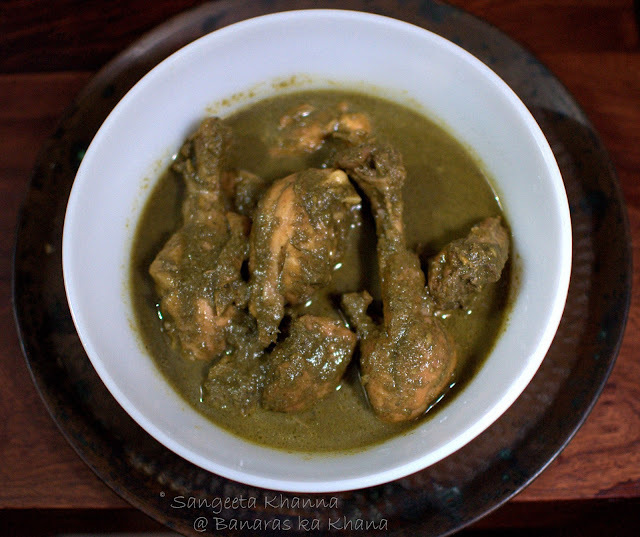 How would you like when the chicken recipe doesn't use any oil or ghee? This one is just that and you wont miss any fats in it. But this recipe is for those who like light chicken curries and are fond of coriander greens and mint. This chutney wala chicken is a favorite of many such people I know. For a few people it is just another chicken curry but then you can always make your own adjustments to it. An everyday chicken curry that fits into your busy schedule is no harm making. The leftovers make nice stuffing for sandwiches. Try that too.